Tactical combat, ruthless aliens and a ginormous disintegration ray. When 2k first revealed its vision for a new Xcom, reaction from fans of the franchise was mixed. Some hated the new run-and-gun direction the gameplay was taking, while others really, really hated it and wished the entire development team would fall into a really deep well. This lack of enthusiasm was not lost on the team at 2k Marin, who now admit that their experience working on BioShock may have led them astray when it came to putting a new shine on the Xcom legacy. The demo we saw is closer to the spirit of the original games, while still staying active enough to woo new players that might be turned off by traditional turn-based strategy. In case you're not up to speed on this new version of Xcom, it's an all new origin story set in 1962 America, a time of social and political turmoil. 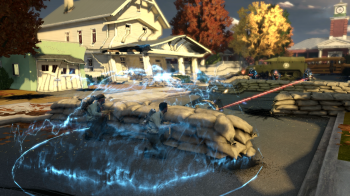 An alien force, which comes to be known as The Outsiders, invades; it falls to the men and women of Xcom to harvest alien technology to use in the fight against them. You play as Special Agent William Carter, who must recruit a team of the top specialists to help further the goals of Xcom. These agents will become your stable of resources, lending their expertise in fields like demolition and ammunition. You can take two companions with you on each mission, tailoring your choices based on the goal you're trying to achieve. You'll select your missions from Xcom's underground base, which serves as the hub for your game. The experience your companions earn during missions can be used toward upgrading their skills,or unlocking new ones. Missions can be selected in any order, and you can even send agents out on missions without you, so that they can earn experience while you're out in the field. It's a clever idea that seems like it would prevent your roster of available agents from getting so lopsided that you wind up with characters that you never bring with you. The mission we saw was a field extraction. The brilliant Dr. Weir would make a valuable addition to the Xcom team by providing your research efforts with a huge boost, so recruiting him would make a lot of sense. Shortly after arriving in Weir's suburban home town, the agents encounter an Infiltrator, an alien that can look like anyone. The Outsiders are made up of a living technology that is also trying to terraform the planet, smothering anything it touches and converting it into something more suitable for the aliens. You're armed, but trying to take on The Outsiders in classic FPS style will only get you killed. You'll have to rely on your companions to survive, which is where the game's tactical elements come in. Opening up the tactical menu pauses the action and displays a list of skills on either side of the screen, one for each of your agent companions. Each skill costs a certain number of Time Points, and you have ten points to spend every time you open up the tactical menu. It's meant to evoke the feel of turn-based combat without actually making you wait for your opponent to make a move. In one part of the demo, the agents were pinned down by an alien turret. Carver first put a defensive shield over the other agents, then had them create a distraction to draw the turret's fire. The shield soaked up the damage while Carver snuck around and took out the aliens manning the turret. Capturing alien technology is another valuable skill, but one that also comes with a choice. Once you've acquired a bit of alien tech, you can either take it back to Xcom HQ to have it analyzed, furthering your research and long term goals, or you can use it immediately for short term. I didn't play the original Xcom games, so feel free to take my opinion with a grain of salt, but I really enjoyed the retro sci fi feel of this new Xcom. We even got to see a big fat disintegration ray gun, which was a lot of fun. The Outsiders are a good villain, clearly so intelligent and more advanced that they see us like little more than bugs, and their blocky appearance is creepy in a Saturday morning serial kind of way. The tactical gameplay is an interesting way to shake up what could've been (and almost was) just another first person shooter, and having a stable of agents should provide plenty of opportunities to mix and match skill sets. I don't know if the changes 2k has made will be enough of a compromise for old school fans of the series, but it looks like this new Xcom is at least trying to find a happy middle ground. Xcom will be release for PC, PS3, and Xbox 360 on March 6.